In the Apr/May issue of MaryJanesFarm, on newsstands March 6, you’ll see how Megan converted an old wicker bassinet into living-room picnic-gear storage that now holds a picnic quilt, a couple of pillows, and board games for the perfect indoor picnic. 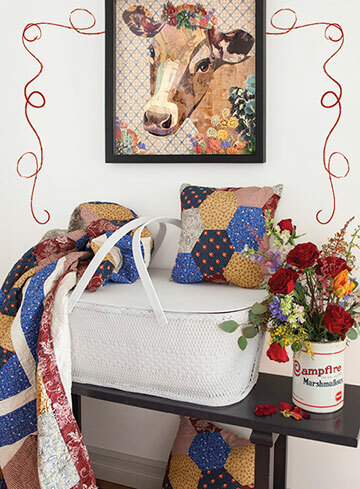 In the photo above, you’ll see my MaryJane’s Home “”Busy Bee” quilt and pillow with my favorite patchwork shape, the hexagon. Why a hexagon? The hexagon, a shape that speaks the zen of the busy beehive or the wired manors of chickens (the oldest domesticated animal on Earth), symbolizes the unity and structure of the farmgirl life—a framework for the proper order of things, a pattern for life. In unwritten feminine language, it is a standard for farmgirls, or for that matter, the ordinary honeybee or the hen, rank and file workers that move the work along. It says that all things are to be done decently and in order, and that small things add up. For a chance to win one of our “Busy Bee” twin quilts and matching 16″-square pillows, tell me all about your favorite picnic experience in the comments below. I’ll toss your name into a hat and draw a lucky winner sometime mid-May. “Am hoping not to be judged by MY cover, too. Congratulations, Jeannie! Watch for an email from the farm. 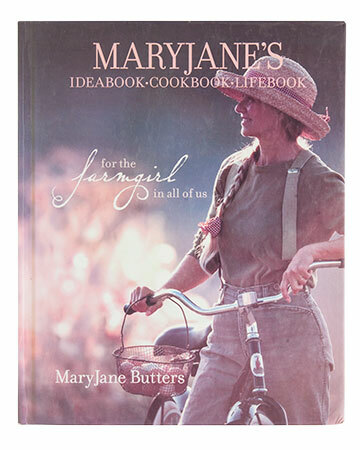 This copy of my first book, MaryJane’s Ideabook, Cookbook, Lifebook: For the Farmgirl in All of Us, was in our store window and ended up with a sun-faded cover. “I’ve been a farmgirl, citygirl, tried the Mother Earth News route years ago, so it was with some skepticism that I checked out this book from my library. Don’t be put off by the reference to “Martha Stewart of the West” because the only similarity I can see is that both Martha Stewart and MaryJane Butters are hard-working women. I don’t think I have ever before read any non-fiction book as closely and with as much pleasure as MaryJane’s Ideabook, Cookbook, Lifebook. I couldn’t be satisfied with the library’s copy, but had to have my own, plus ordered one for my daughter-in-law. The pictures are beautiful, from antique implements to happy people. The verbal sketches of family, friends, and helpers is uplifting. What struck me most about Butters was her positive attitude. She advocates organic farming and living, but rather than trying to force others to conform to her way of thinking and doing, she found ways to work with local farmers. In using local products, she has connected growers with consumers and built a business for herself, family, and friends. To lay claim to this (sun-faded) copy, tell me what at MaryJanesFarm has inspired you … magazine, books, products, chatroom, or journal. We’ll put your names in a basket and pull out a lucky winner sometime soon. Check back to see if it’s headed your way.